Watch the record setting race right here. 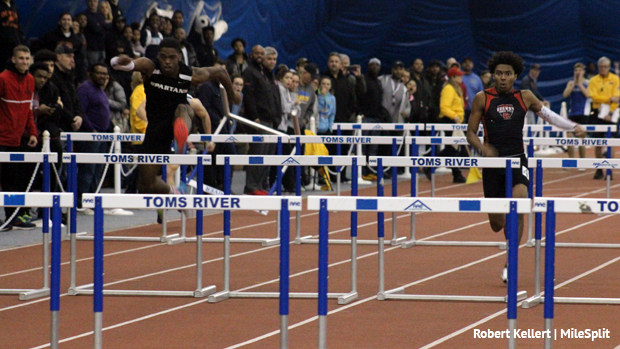 The Deptford boys had a big Friday night at the NJSIAA Group 2 State Relay Championships. Not only did they win the team championship in a hard fought battle with Rahway 42 to 37 but on the way their shuttle team also broke the NJSIAA Relays overall meet record, the Bubble facility record, and moved up to fourth all-time in state history. The relay order went Naseem Smith, Tyrece Brown, Khion Smith, and Tyriq Bundy. They have big plans for this event moving forward including a run at the New Balance Nationals Indoor title as well as a shot at the 28.62 National record. A record currently held by New Jersey's East Orange Campus since 2017 when they won New Balance Nationals Indoor. On the New Jersey all-time list there are only four relay squads ahead of the 2019 Deptford team. East Orange at the top having run 28.62 in 2017, the national record, they placed second the following year at NBNI for third on this list with 29.44 as well. Ranked second all-time for the state is the 2013 New Balance Nationals Indoor winning Union Catholic squad who posted a 29.20, they also sit US#3 all-time and this was the National record at the time they ran it.